Classic 1915 Militaire Motorcycle Roars Down The Streets! It is amazing to witness vintage motorcycles still running and roaring like new. In this video we get a look at one fine 4 cylinder MILITAIRE that was produced from 1913 to 1917. This specific one in the video is from 1915 and roars like it just came off of the production line. Turn up your speakers and check out this classic by clicking the video! 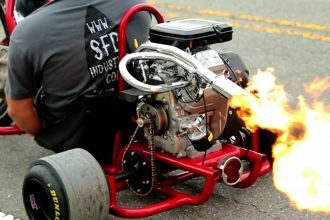 SFD Industries FLAME THROWING Motorized Drift Trike Goes NUTS!